I was really excited when I heard that international dumpling superstars Din Tai Fung were opening a restaurant in Melbourne. Right in the centre of the city, too, in the Emporium shopping centre. I was salivating over the prospect of sneaky lunch break xiao long baos! However, knowing how much Melbournians love the next big thing, I was prepared to wait until the inevitable queues subsided before trying it out myself. So you can understand how thrilled I was to be invited to an intimate launch dinner during their first week of opening! 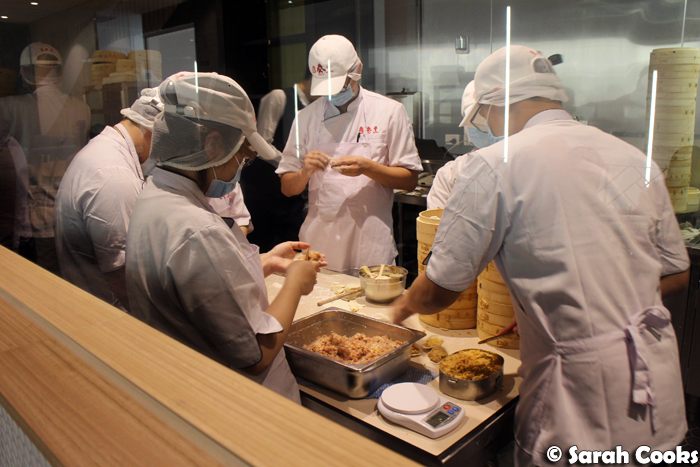 Melbourne's Din Tai Fung is located on level four of Emporium (take the escalators from the level three food court, or the external lifts from the corner of Caledonian Lane and Little Bourke Street), and is gigantic. I'm told it will seat up to 235 diners, but as they are still in their early days of operation (less than a week so far! 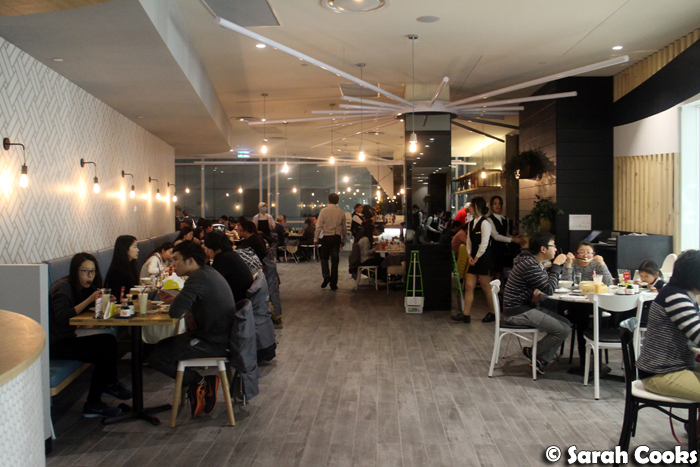 ), the owners haven't filled the restaurant to capacity with tables yet - more will come as the team gets more confident and settles in to the new location. 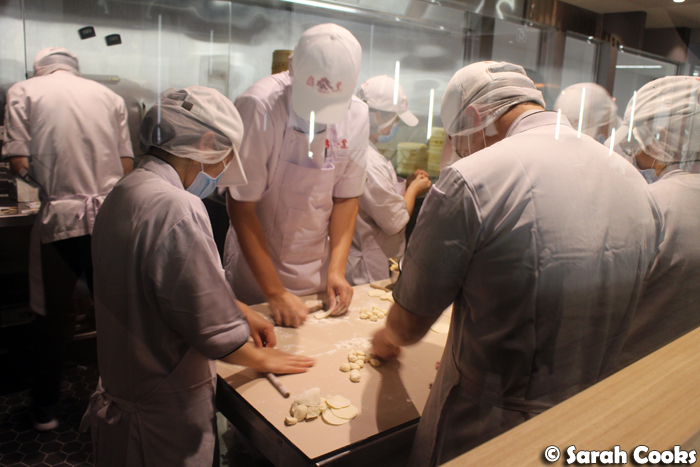 You can watch the dumplings being made in the large glass-walled kitchen near the entrance. I was super-impressed by the precision in the kitchen. With all the protective gear, it almost looked like a cleanroom, where one might, say, conduct scientific research or build satellites. 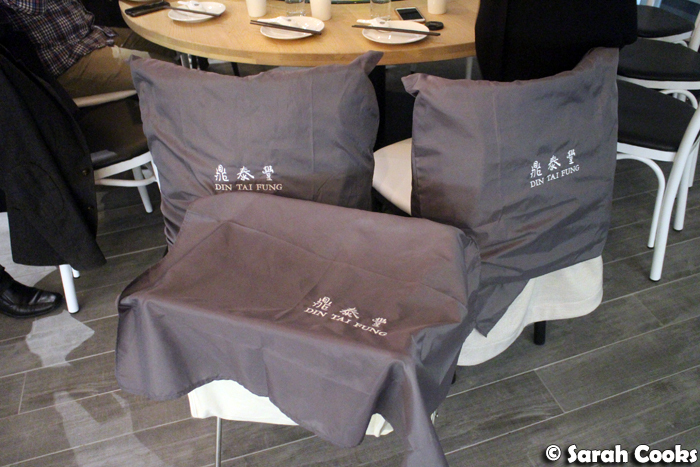 Check out these awesome bag holders and seat covers - keeping your bags and coats free from dumpling-soup stains. Love it. Bag rests and seat covers! For this dinner, our small group of bloggers ate with Dendy and Shin, the husband and wife team who own and operate all the Din Tai Fung outlets across Indonesia and Australia. 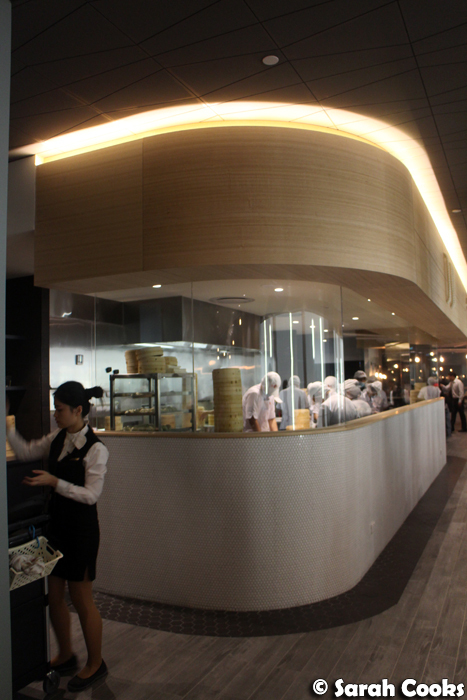 We were treated to a range of items across the menu, showing off Din Tai Fung's speciality items as well as Dendy and Shin's favourites. 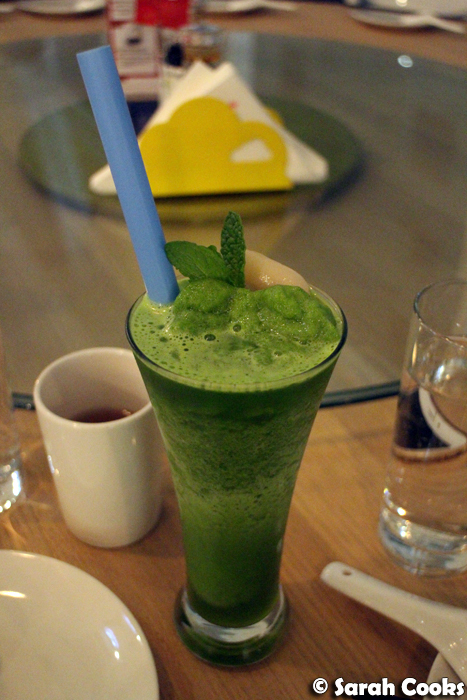 I'm not generally the type to order big sugary drinks, but I really enjoyed the lychee and mint freeze - made with fresh mint, it was refreshing without being too sweet. 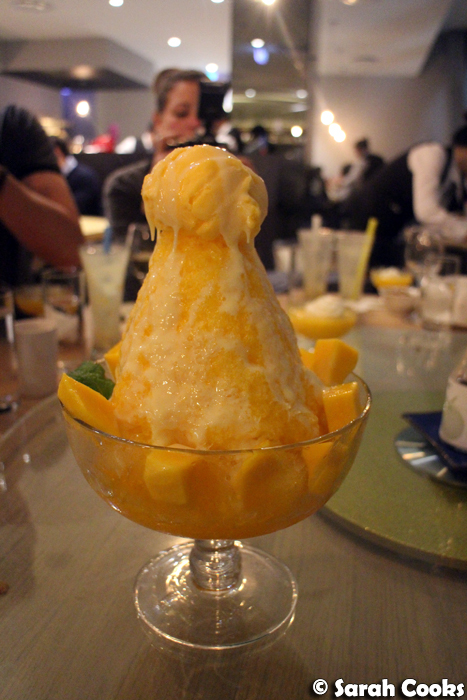 Also delicious was the yuzu and peach freeze, which had a unique citrussy kick from the yuzu. 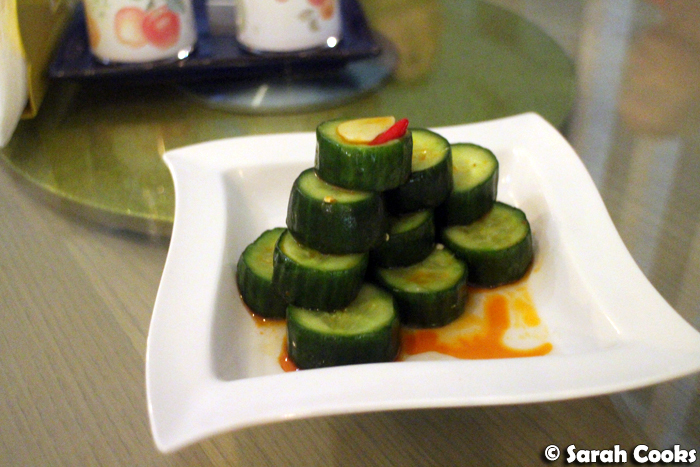 I wouldn't think to order cucumber salad myself, but these were surprisingly addictive and we kept going back for more. The mango shrimp rolls are, I'm told, exclusive to Australian Din Tai Fung - a dish created to take advantage of the great mangos we have in Australia. 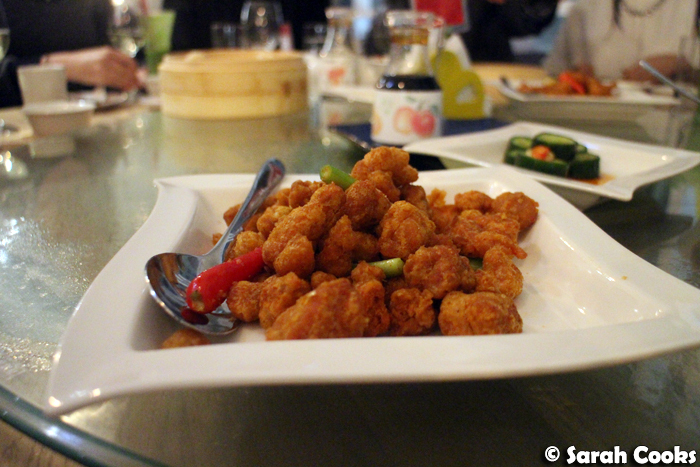 The shrimp and pork wonton were served in a sauce of chilli oil and ground Sichuan peppercorns - really moreish. 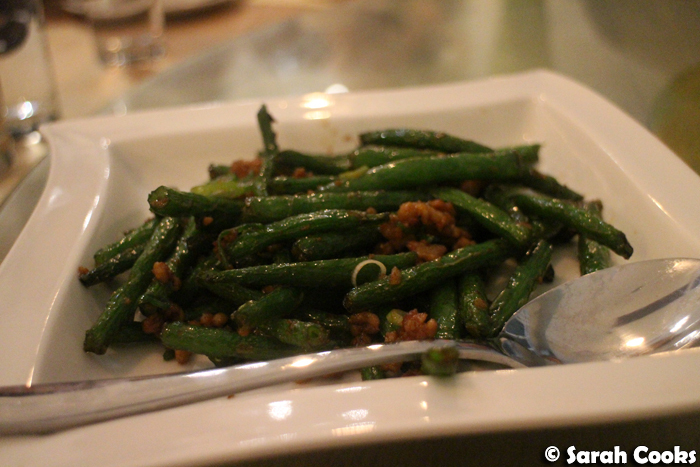 The green beans were nice, but not to my personal taste - these were on the sweet side, and I prefer the aggressively salty kind, liberally dusted with Sichuan pepper. Din Tai Fung's shao mai (Shanghai-style) looked very different from the Cantonese siu mai that I normally get at yum cha. 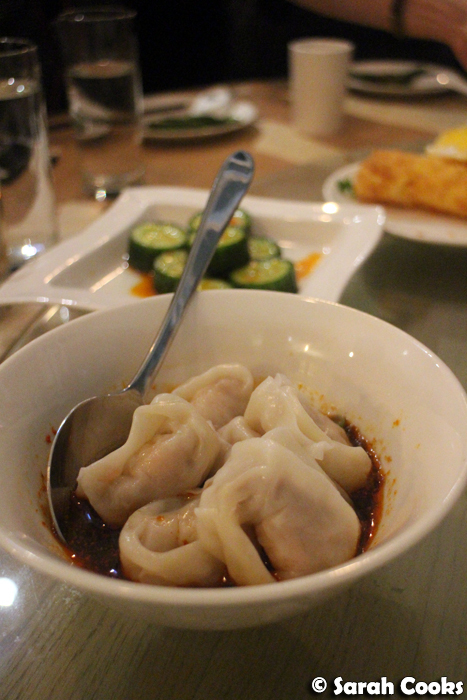 I don't actually like yum cha siu mai, finding them a bit rubbery, but these shao mai were awesome! Each shao mai was topped with a generous piece of prawn, the skin was soft and thin, and the filling underneath had pork and a little soup. Really great! 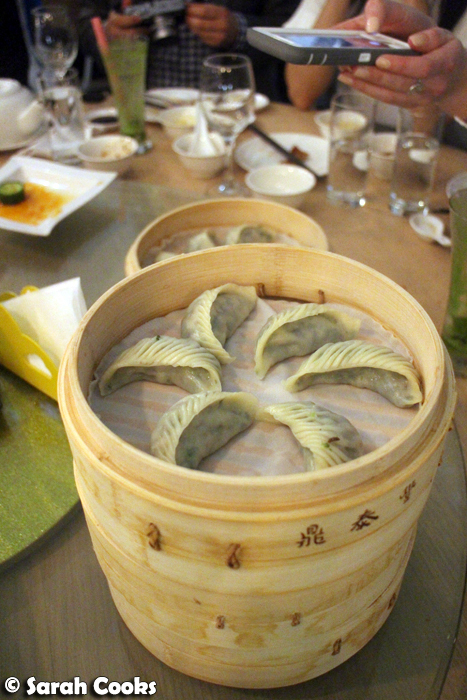 Sometimes vegetarian dumplings can be a disappointment, all dough and bland filling, but these vegetarian jiao ze were very impressive. Inside the delicate skin (look at all those folds!) was a mixture of Shanghai spinach, vermicelli, black fungus and tofu. The amount of filling was generous and the flavours were distinct. 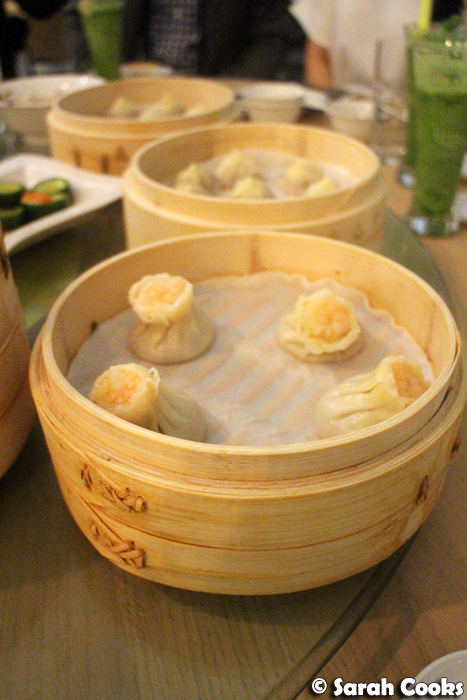 And what can I say about the xiao long bao? 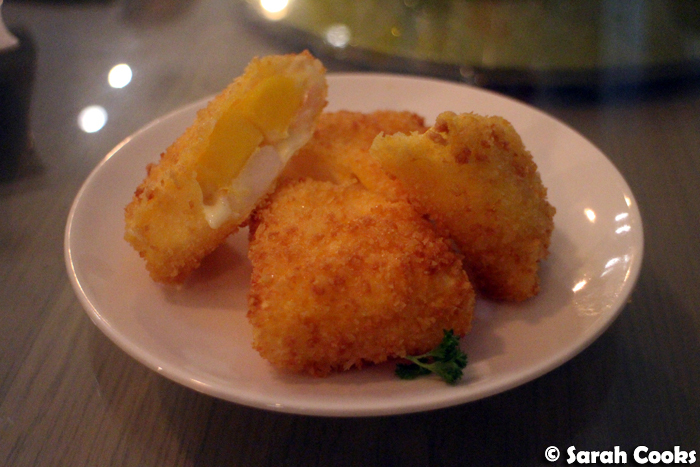 These were definitely my favourite dish of the night. They looked perfect, and despite the super delicate skin, none of them broke on the way from the steamer, to my spoon and then to my mouth. Yay! Definitely want to go back for more! 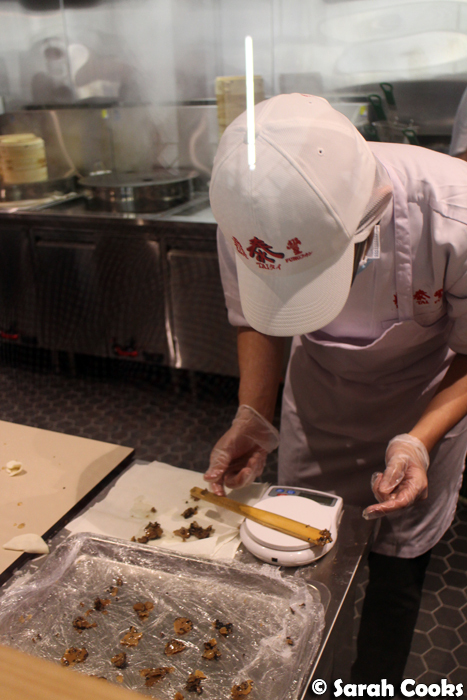 Din Tai Fung is also offering a special black truffle xiao long bao - each dumpling has a little slice of black truffle in it, and it is recommended that you eat these without soy or vinegar so that you can get the truffle flavour. These have quite a strong aroma and flavour - you definitely taste the truffle! They are a novelty, but a very tasty one. 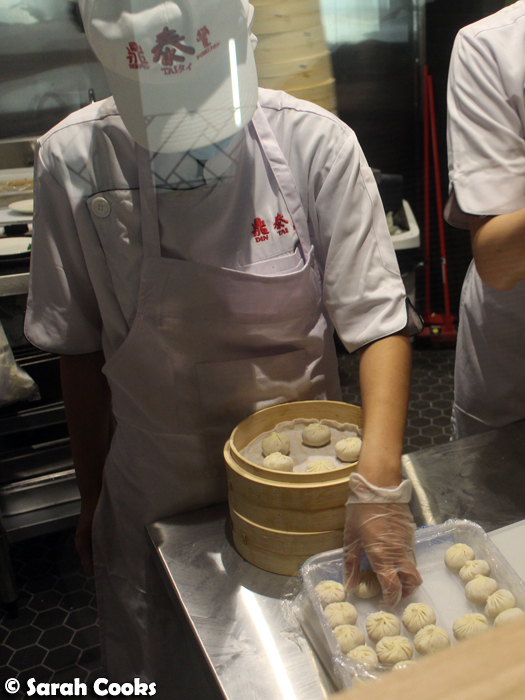 This dish was one of Winston's favourites from his visits to Sydney's Din Tai Fungs, and I can see why. 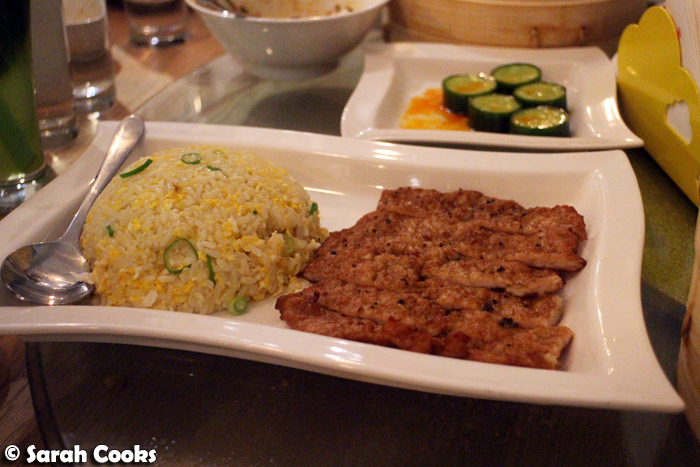 The boneless pork chop was tender and flavourful, and eggy fried rice is perfect comfort food. These cha jiang noodles were another homestyle, comforting dish, consisting of wheat noodles topped with a sauce of tofu, pork, beans and (I believe) fermented soy bean paste. 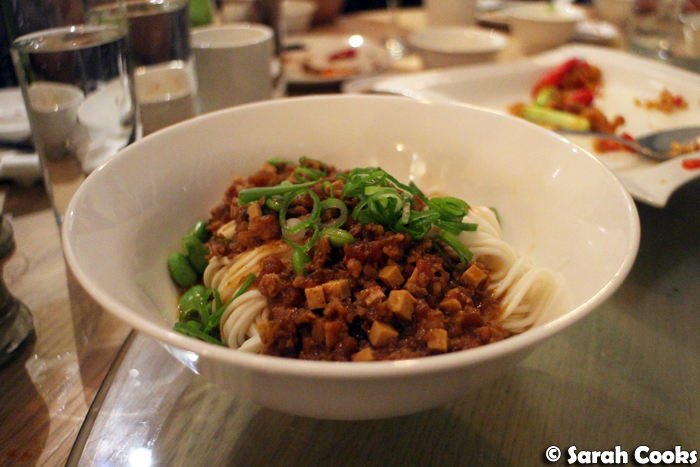 The noodles were cooked quite firm, which I really liked, and the whole dish was presented quite elegantly. Come to think of it, both this dish and the fried rice were good examples of comfort food done in a refined way - they looked nice, had delicate flavours and weren't greasy or heavy at all. 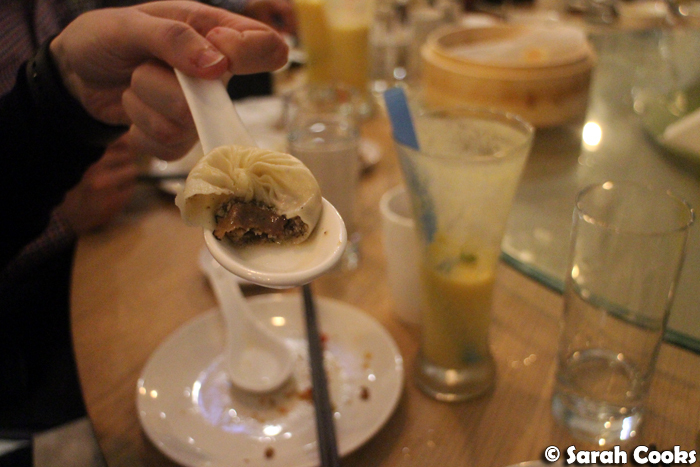 I'd be keen to go back and try Din Tai Fung's take on one of my favourites, dan dan mien! 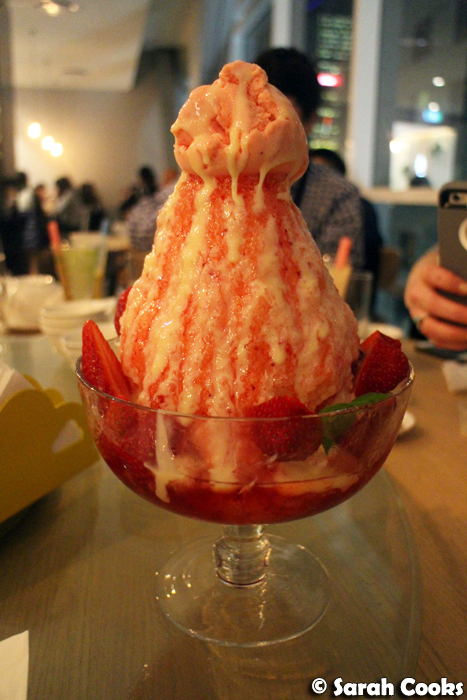 And then, out came two gargantuan crushed-ice dessert mountains! They were huge, and are meant to serve five to six people. 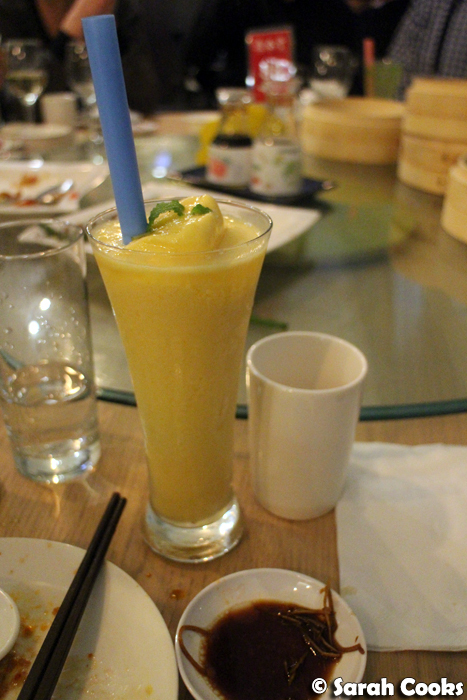 From the way they looked, I thought they'd be really sweet, but they were actually very light - the base is crushed ice, and even with the syrup, fresh fruit, evaporated milk and ice-cream, the overall effect is quite refreshing. These make a nice dessert after a big meal of dumplings! (And they do come in smaller sizes too). I'm not usually a taro person (red bean and green tea for the win! 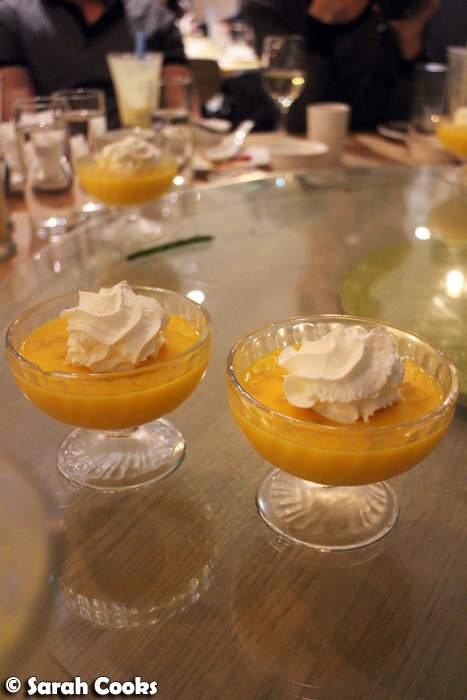 ), but I loved this dessert, and it was actually my favourite out of all the desserts we tried. 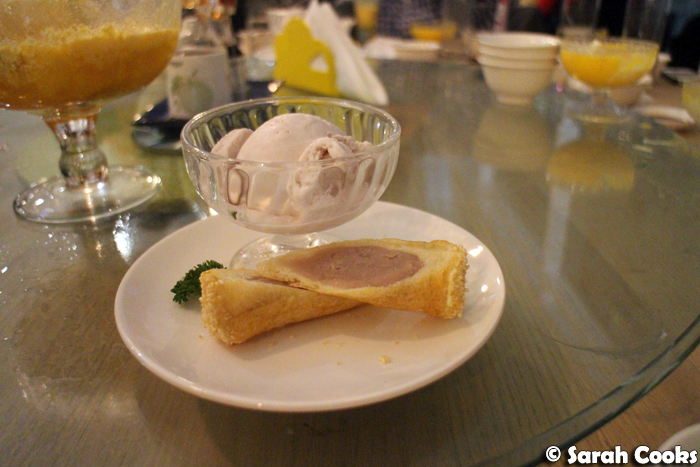 The taro gelato was super light and creamy, and the golden taro bread was a definite winner. The filling was made of smooth mashed taro, which was encased in white bread, with each end dipped in sesame seeds and then deep fried. Deep fried! The gelato and the golden taro bread are sold separately, but I would suggest ordering them together, because the combination is so good! 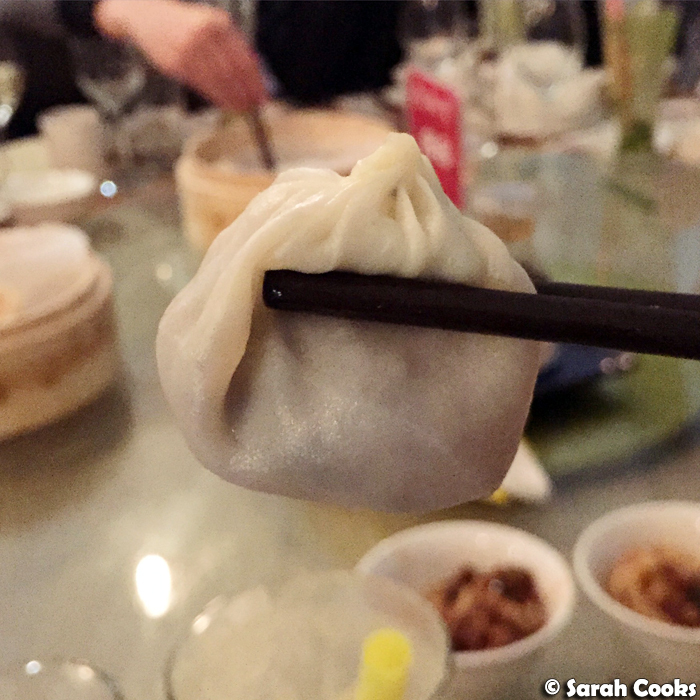 We really enjoyed this dinner - not only was it a great chance to try a large range of different dishes, but it was also great to catch up with some awesome blogger peeps, which is always fun, and to meet the lovely owners of Din Tai Fung. 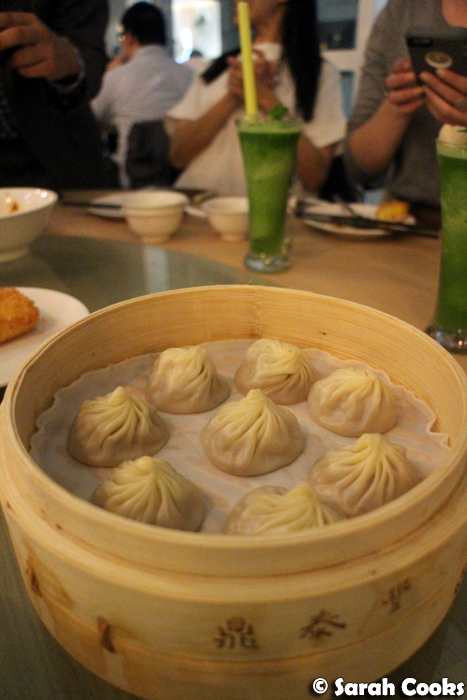 Sarah and Sandra dined as guests of Din Tai Fung, with thanks to Dendy and Shin! I love their dumplings! They are so good and pretty much everything that we've ordered there is delish. I can't believe it took so long for Melbourne to get one though! 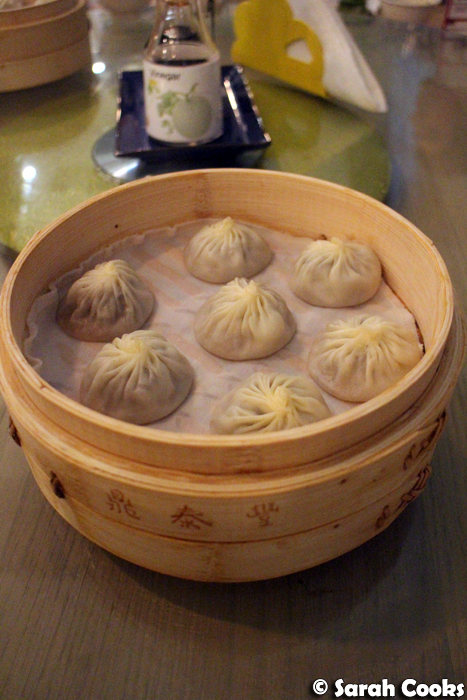 Ooh you can't beat a good xlb! I always end up staring like a little kid into the prep kitchen here. Their speed and precision is phenomenal. We went in Seattle and had a great lunch - really wish it was easier to find good dumplings here!